Watching a servo-driven press optimized for particular tool applications is like watching a great athlete in action. Some athletes, say basketball players at the top of their game, achieve greatness seemingly without effort. The best athletes appear to operate in slow-motion, hardly breaking a sweat while piling up stats and wins. The same is true in the pressroom. 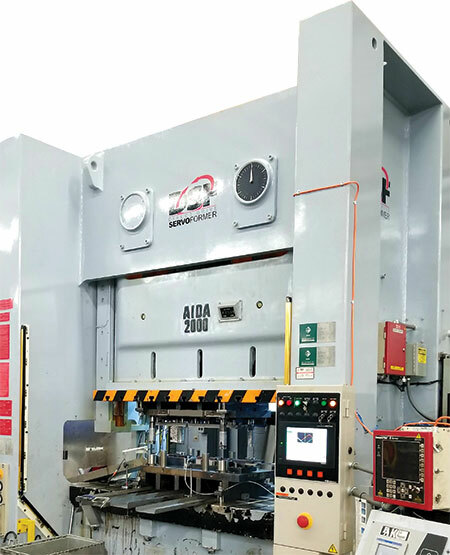 Rarely does a servo-mechanical press appear to reach the highest speeds or strain to produce, yet high-quality part after high-quality part exit the machine without pause, at surprisingly high rates. But productivity improvements aren’t limited to a job run. Productivity progresses from job to job and application to application, due to significantly increased die life and a decreased need for press repair and long-term maintenance. These advantages stretch across the tooling spectrum, particularly in relation to complex progressive tools. To find out why, and to back up the testimony from more than one metalformer, MetalForming magazine explored the topic with Bob Southwell, vice president of sales and marketing for Aida-America, an experienced player in the servo-mechanical-press market. “Complex-progressive-die applications often feature a lot of intricate, tight-tolerance tooling,” says Southwell. In many cases, tool wear in these scenarios result from vibration in the tooling and in the press. How does a servo-mechanical press bring advantages here? In these cases, using servo-mechanical presses brings benefits in three ways. “First, a metalformer can run a shorter stroke length using pendulum-crank motion, which reduces stroke velocity,” says Southwell. Here, the press is programmed to use only a portion of the bottom of the press stroke, as the crankshaft or eccentric gears swing back and forth. In general, pendulum motion enables a switch from long-stroke heavy-forming operations to short-stroke light forming in the same press, yet delivers optimal forming speed for any stamping operation, according to Southwell. A silent blanking-motion profile, which refers to decreased noise levels as the tooling blanks part material, further reduces shock and vibration. Besides decreased shock and vibration, lowering punch velocity at key points in the press stroke significantly reduces heat generation, which also helps improve die life. As with other types of tooling, complex progressive dies can be negatively impacted by snapthrough forces. As hinted at above, servo-mechanical presses bring much to the table in combating these forces and their detrimental effects. “When a tool engages part material, snapthrough directly relates to the speed at which the tooling cuts through the materials,” Southwell says. “If, in programming a servo-mechanical press, you can reduce velocity just for that very short impact distance, say from 100 to 20 percent, you typically can reduce the shock load by about the same percentage. So, shock load decreases by 80 to 90 percent. Interference between the punch and die via vibration causes tools to chip and wear, and can, long-term, harm press components. Thus, eliminating vibration pays dividends. As Southwell explains, manipulating stroke length and speed along the stroke length pays big dividends. The key is to properly program a servo-mechanical press to optimize these settings. “Even though metalformers want to minimize shock and vibration at the point of contact, they don’t want to slow down the entire process,” says Southwell. Here is where productivity gains are accomplished, and where press and control providers can greatly assist metalformers. From there, engineers program the stroke length to best achieve good part quality and ideal tool life. Then, speed and force intervals are tackled to improve productivity. In the case of many progressive-die applications, according to Southwell, that means shortening the stroke length. The result? Thus Southwell has pinpointed where a servo-mechanical press, properly tuned to the tooling and the application, in a sense becomes the elite athlete, performing seemingly effortlessly, yet quite effectively.